Home about us News Oak Crest’s Outreach Activities in the News (Again)! Oak Crest’s Outreach Activities in the News (Again)! It’s no April Fool’s joke! Once again the 2018 Monroe prizewinner, Oak Crest Institute of Science, has attracted the attention of the local media with a feature article in this week’s Monrovia Weekly. Educational outreach is an important part of the Oak Crest mission, and working with the City of Monrovia we are able to give local students authentic laboratory experiences in the biomedical and chemical sciences. A reporter and photographer visited us recently to obtain more information about our educational programs. The report highlighted our Sci-Lab family activities at the Monrovia Public Library, the summer Junior Researcher Academy, which is open to students in grades 7-9, and our internship for high school and community college students. 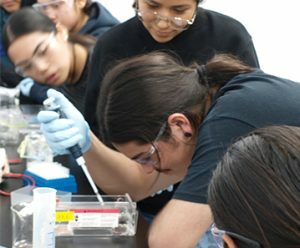 The media visit coincided with a laboratory class for the students from the Anahuacalmecac International Preparatory High School of North America.